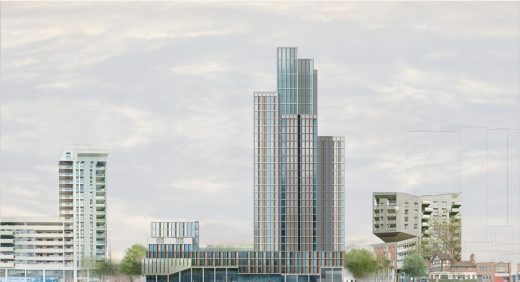 The University of London, in partnership with University Partnership Programmes (UPP), has reached financial close on a £105M deal to house over 500 students in a new 33-storey building in Stratford. Construction on the mixed-use development, Duncan House, will commence in March 2017 and complete by autumn 2019. The upper levels, offering spectacular views, will comprise 511 student bedrooms and communal space, totalling 18,000m². It will also become a first major property acquisition by the University in over 50 years. The University, who acts as a central provider of student accommodation for its member institutions, owns c. 3,000 beds across central London, however Duncan House will be a first in east London and will strengthen the diversity of the University’s current provision. The architects behind the design are the award winning practice Hodder and Partners. The Watkin Jones Group have been selected to construct the building. Duncan House will meet the student demand for high quality accommodation which balances affordability with low travel times to their place of study. 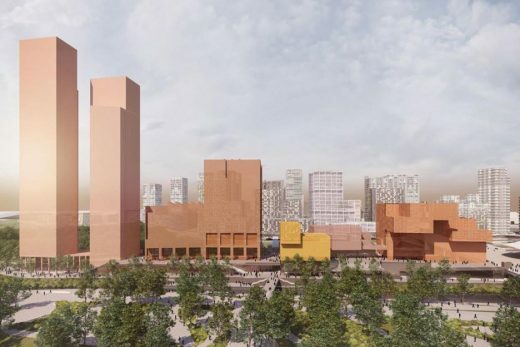 Stratford is a dynamic and well connected location and will see the planned UCL development on the Queen Elizabeth Olympic Park. This acquisition is in keeping with the University’s plans to invest in quality accommodation to meet future demand from prospective students. Chris Cobb, Pro Vice-Chancellor (Operations) and Chief Operating Officer of the University of London, said: “This is an exciting and significant investment for the University. It’s the first major property that we’ve acquired in 50 years and the first outside of central London. render courtesy Ginseng Chicken Architecture P.C.